Friday, March 8, 2019 is International Women’s Day – a day to celebrate the achievements of women while calling for a more gender-balanced world. 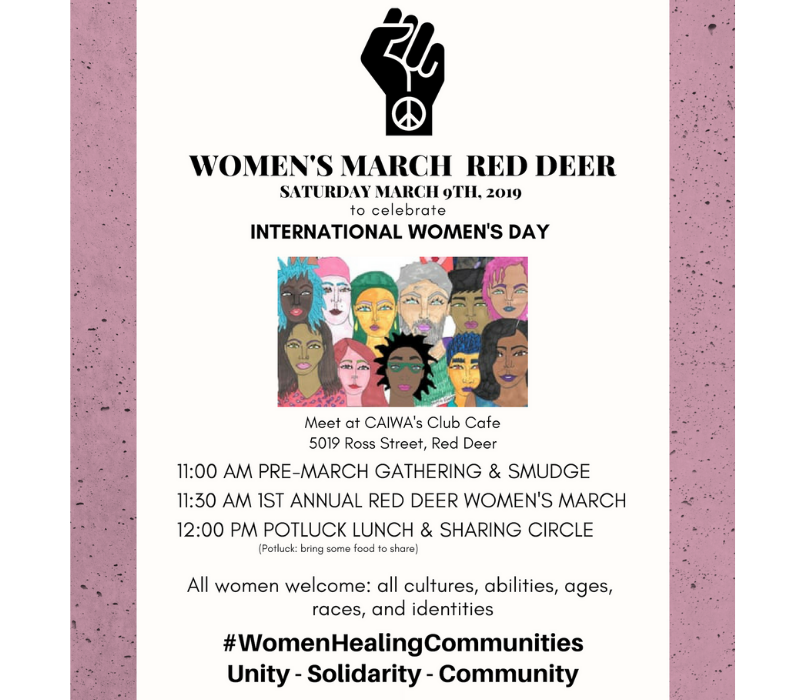 To recognize Women’s Day, the Central Alberta Sexual Assault Support Centre (CASASC), Red Deer Welcoming and Inclusive Communities (WIC) and the Central Alberta Immigrant Women’s Association (CAIWA) will be teaming up for the first annual Women’s March Red Deer! Take part on Saturday, March 9 in an empowering march designed to raise awareness and encourage women to be a visible force for positive change in their communities. The event will start at 11 a.m. at CAIWA’s Club Café (5019 Ross Street) with a pre-gathering and smudge ceremony. The march will set off from the Café at 11:30 a.m., winding through the downtown core, returning by noon. All are invited to attend the march – all cultures, abilities, ages, races and gender identities. Following the march, a potluck lunch and sharing circle will be held. Attendees are welcome to bring food items to share with the group. The purpose of the march is to not only bring awareness around International Women’s Day, but to connect a diverse group of women from the central Alberta region to create unity and solidarity in the community. Attendees are encouraged to bring signage for the march that is empowering, inclusive and respectful. A poster making party will be held on March 3 for those who want to make a sign in advance in a collaborative setting. The goal and messaging of the Red Deer Women’s March aligns with Women’s March Canada, on the principals that all people of all backgrounds – women and men, gender non-conforming people, indigenous and immigrants, of diverse faiths, abilities and ages – are all deserving of equality, justice, freedom and inclusion. Organizers plan to make the march an annual event. When: Saturday, March 9, 11 a.m. to 1 p.m.
CAIWA aims to raise the level of awareness of immigrant women and their families in all aspects of Canadian life, and to assist them in achieving their full potential as members of Canadian society. The Red Deer Welcoming & Inclusive Communities (WIC) Network was established following a series of City-led community conversations on building a welcoming and inclusive community related to Indigenous People, immigrants and refugees, sexual orientation, gender identity and expression, visible minorities, multi-faith, persons with disabilities, multi-generations, and gender equity; all aspects of diversity.